Pumphouse Point is one of the most spectacular resorts in Tasmania, best known for its luxury suites over the water at Lake St Clair. 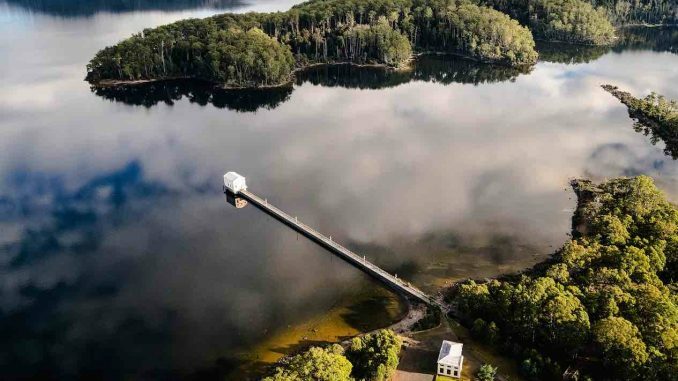 Originally constructed in 1940 to pump water for hydro-electricity, the iconic post-industrial site has been refurbished to offer boutique accommodation inside Tasmania’s Wilderness World Heritage Area. This intimate property offers just 18 rooms, located in the Pumphouse building out on the lake, and also in the Shorehouse building on the water’s edge. Just before Christmas, Pumphouse Point owner Simon Currant and his team are launching new one-off luxury accommodation to be known as The Retreat. The Retreat is billed as offering the highest-standard accommodation at Pumphouse Point — pricing starts from $1,275 per night — and it is hidden away on the edge of the lake, surrounded by native bush. The Retreat is an unashamedly luxury experience, and includes all food including dinners (served privately or at shared tables in the Shorehouse dining room), an expanded larder brimming with the best local produce, wines, and Tasmanian craft beers, ciders and spirits. Designed to showcase the lake’s natural beauty and unpredictability, The Retreat features locally crafted furniture, ceramics, bath products and two deep tubs for soaking — one under the stars. Tasmania is fast-emerging as Australia’s micro-distilling hotspot, and Charles Oates Distilling in the Huon Valley has now taken matters a step further with new distillery tours and tastings. The polished copper of the the traditional Charentais alembic, still in the distillery room at Willie Smith’s Apple Shed, is an impressive sight and it produces intensely-flavoured apple-based spirits like Charles Oates Fine Apple Brandy and Charles Oates Apple Blanco. Willie Smith’s is now offering small-group guided tours of the distillery led by Dr Tim Jones, Willie Smith’s head cider maker and distiller, or one of his team of gifted artisans. “Our still is based on the 16th-century stills made in the Charente region of France, the home of Cognac,” Jones says. “Although it’s a traditional design, the still was hand-built in Tasmania by local master craftsman Peter Bailly. It is a beautiful object in its own right and we are very excited about the high quality of the spirits coming from it. Guiding a maximum of 10 people on the 1.5 hour tour, the distiller will explain the French art of cider distillation using the Charentais still, which is the only one of its kind in Australia. Tastings of Charles Oates spirits will be matched with tasting platters designed by Willie Smith’s Apple Shed head chef John Molina. Andrew Smith is the fourth generation of Smith family orchardists to grow and harvest apples at the same location in the Huon Valley. Full details and bookings for the new Distillery Experience can be found at www.williesmiths.com.au/tours. Truffle Lodge, Tasmania’s latest tourism accommodation, takes camping to a whole new level. Operated by John and Laurelle Grimley, who own five-star Woodbridge on the Derwent in nearby New Norfolk, Truffle Lodge is the ultimate in glamping and sits right on the banks of the River Derwent at Gretna, less than an hour out of Hobart. Truffle Lodge, set next to a real hazelnut-planted truffiere from 1998, is a luxury camping resort set on 12 acres of river frontage and dotted with eucalyptus trees that provide much-needed habitats for the endangered swift parrot. It is being promoted as “five-star luxury under canvas”. There are currently four double tents up and running, and what tents they are: big double beds, decks overlooking the river and full bathrooms with their own wooden bathtubs. Each tent has a hardwood floor and is double-walled and triple-roofed for maximum insulation. Initial plans are for eight tents that follow the river line. Each will have a fan and electrical fan-forced mock fire. All tents have a coffee machine, towels, bar fridge, hair dryer, rocking chairs on the deck, hammock and free wifi, along with access to public lounge and dining areas. On-site activities will include canoe and rafting tours, farm gate treks and cellar door tours, fly fishing experiences, helicopter transfers, and bikes will be available for loan. Tourists in Tasmania have yet another gourmet option to choose from, with the recent opening of the Taste House at Woodbridge Smokehouse, 30 minutes south of Hobart. Visitors can enjoy traditionally-smoked ocean trout and Atlantic salmon direct from the smoker, which is just down the road from Grandvewe Cheese. The Woodbridge Smokehouse is set on a 25-acre apple orchard. Traditional hand-smoking processes using a mixture of local hard woods (including the apple orchard shavings) create delicate and distinctive flavours. Foodies are invited to discover the unique taste for themselves by dropping into the tasting room to sample the award-winning fare. The Taste House is open daily during the week from 10am – 4pm, from noon – 4pm on Saturdays, and by appointment on Sundays. The setting, along with its stunning water views, provides an irresistible backdrop to a tasting table with products that include a new salmon spread with lemon and crackers. On Thursdays and Fridays there is a ‘go behind the production’ tour (for groups of 4 – 8, with bookings essential) to reveal the finer details of the purpose-built smokehouse and processing facility. Tours last approximately an hour and cost $45 per person, including tasting samples. A liquor licence has been applied for. It’s not new, but one of Hobart’s most gracious old homes, Corinda, has recently undergone a tasteful renovation. The owner’s great-great grandfather, Alfred Crisp, built this magnificent private house, which is one of Hobart’s biggest. He went on to become Hobart’s Lord Mayor. Ideally situated for exploring southern Tasmania’s world-class attractions like MONA, Port Arthur, and Maria Island, Corinda is tucked away in the heritage suburb of Glebe, just a short stroll to the Hobart waterfront. With far-reaching views over the harbour and local parkland, this unique boutique hotel has several spacious bedrooms, and various outbuildings and cottages. All are different, furnished with original antiques and mellow textiles. Breakfast here is a highlight, featuring fresh home-baked bread, eggs from the owner’s own farm, crisp organic bacon, and tasty local jams to be enjoyed on a verandah overlooking delightful gardens. Rooms start from $299. See www.corindacollection.com.au.